If you're overweight, losing just 5 to 10% of your weight can improve irregular periods and infertility, and other problems caused by PCOS, such as insulin resistance. For advice about losing weight see How to lose weight. The following tips will also help you to lose weight. Choose lots of different foods from the tables below. The tables show four food groups. You need food from all four of the groups, so try to have something from at least three of them at every meal. Use the servings sizes in the tables below and follow the healthy plate model in the picture for your main meal. Choose wholegrain breads and cereals, brown rice and wholemeal pasta. They're rich in nutrients, high in fibre and help to keep your blood sugar levels stable. Look for products that say "wholegrain" on the package or contain 5 g or more of fibre per 100 g of food. Avoid added sugar (sometimes called fructose, glucose or sucrose) or honey in food and drinks. Keep cakes, biscuits, sweet pastries, chocolate, lollies, ice cream and puddings for occasional treats. Use margarine and healthy oils such as canola, peanut, olive, rice bran, sunflower, soy bean. Instead of frying or roasting, use low-fat cooking methods such as baking, grilling, microwaving, boiling, and steaming. Eat three meals a day at regular times. If you're hungry between meals, have healthy snacks such as fresh fruit, low-fat milk, lite or plain unsweetened yoghurt, reduced-fat crackers with cottage cheese or avocado and tomato, and a small handful (30 g) of unsalted raw nuts. If you aren't active, ask your GP or practice nurse about a Green Prescription. This includes a free consultation with a physical activity coach to create a personal activity plan for you. It also gives you the opportunity to take part in group physical activity sessions. You may want to consult a dietitian to help you develop an eating plan that suits your lifestyle, manage your symptoms and help you to lose weight if you need to. Choose at least six servings every day. A serving is one medium slice of bread, ½ to 1 cup of breakfast cereal, or 1 cup of cooked rice or pasta. Choose at least three servings of vegetables and two servings of fruit every day. A serving is size of the palm of your hand. 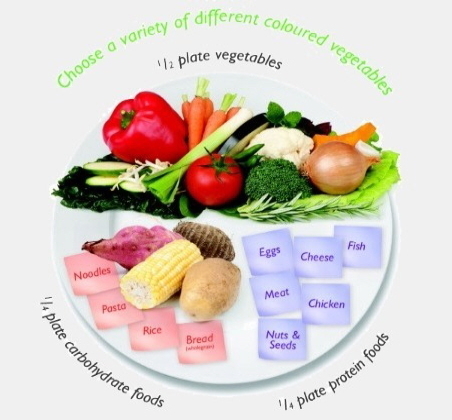 Try to have many different colours of vegetables and fruit, as they all have different antioxidants and vitamins. Choose two to three servings every day. A serving is 1 cup (250 ml) of milk, 1 pottle (150 g) of yoghurt or 2 slices (40 g) of cheese. Small amounts of margarine and oils. Written by the Christchurch Branch of Dietitians New Zealand. Adapted by HealthInfo clinical advisers. Last reviewed April 2018.